Cellulitis is an acute purulent inflammation of the tissue without distinct boundaries. Depending on localization distinguish subcutaneous cellulitis, subfascial, intermuscular, retroperitoneal, pelvic, phlegmon feet, hands and other Flegmonas inflammation of the walls of hollow organs also sometimes called phlegmon of this body (the colon, stomach, vermiform process - phlegmonously appendicitis). Pathogens phlegmon can be a variety of microorganisms, among which are more common aureus, Escherichia coli, Streptococcus. Germs are often penetrate minor damage to the skin or mucous membranes, sometimes cellulitis may develop from an initially limited purulent (abscess, furuncle) due to the high virulence of microbes, the weakened condition of the body or incorrect treatment, destroying pyogenic membrane (for example, squeezing boils, acne). Less common cellulitis hematogenous origin, when infectious material is put into the blood stream from a distant fire (osteomyelitis, caries and others). The introduction of bacteria comes first serous impregnation of fabrics, which quickly takes purulent. Unlike abscess (see),when the abscess protective granulation shaft in fabrics not formed, purulent soaking fabrics does not have clear boundaries and tend to spread interstitial fiber cracks. The clinical picture. For the beginning of the disease characterized by severe pains in the affected area and a temperature of 38-40°, often with fever in the blood is usually a marked leukocytosis, and neutrophilia, stab shift formula. When the subcutaneous cellulitis appears severe swelling and voltage tissues without clear boundaries, later you receive local fever, redness, Sablina (see). Fig. 1. Phlegmonous adenitis neck. Fig. 2. Abstemiously abscess brush. Fig. 3. Deep phlegmonous adenitis hips. When deep abscess affected area increases in volume compared with healthy, probed deep painful infiltrate without clear boundaries (Fig. 1-3). Fluctuation (zublena) may not be detected. The presence of pus revealed only a puncture. The phenomenon of intoxication when deep abscess expressed more than superficial. The diagnosis of cellulitis is established on the basis described clinical symptoms in doubtful cases and in the deep (subfascial) localization is often used diagnostic puncture. Getting pus at the puncture is reliable sign phlegmon. Flegmonas inflammation of the internal organs (bladder, vermiform process and others) is one of the varieties of acute appendicitis and acute cholecystitis or other acute surgical diseases associated pattern of acute abdomen (see). Patients with these diseases subject of urgent hospitalization to the surgical Department and, as a rule, surgical treatment. Forecast with timely diagnosis and early correct treatment is favorable. 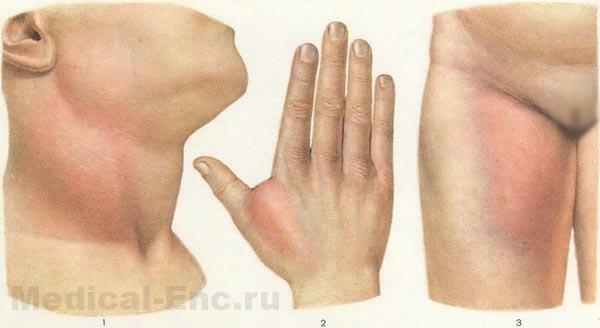 Treatment of patients with abscess should be carried out in the hospital. Early in the disease, when it is supposed only serous impregnation of fiber without the formation of pus, conservative activities - large doses of antibiotics (intramuscularly), nilusparti compresses, UHF with mandatory strict alone limbs, elevated her status and plaster immobilization Longuet. Recommended casing novocaine blockade on Vishnevskaya (see Blockade procaine). Improvement of General condition, the pain subsided, reduction of infiltration, the decrease of temperature are the grounds to continue with conservative measures to complete resorption of infiltration. When there are obvious signs of purulent fusion (fluctuation, pus, obtained by puncture) shows emergency opening phlegmon. In the presence of severe intoxication, sharp extensive swelling can be made opening phlegmon and in the stage of serous impregnation. Opening of surface phlegmon is usually in the zone fluctuations and most hyperemia skin. Opening deep cellulitis is a surgeon, respectively topographic anatomic landmarks, different for each area of the body. Local anesthesia is not providing full of pain, so opening phlegmon often made under short-term intravenous or mask anesthesia. After opening of abscess one or more wide enough cuts in the wound enter drains and tampons. Further, the patient is treated, as if infected purulent wound (see the Wound, injury). Prevention phlegmon: prevention and timely treatment of the production of microtraumas, equipment for the production of washbasins with hot water and soap, first aid kits; timely and correct treatment of the purulent diseases of the skin (piodermia, boils and other); strict observance of aseptic after subcutaneous, intramuscular and intravenous injections of drugs.